Imagine being able to grab the attention of a global community of Cat Lovers. We offer a ONE day Timed ad overlay, that includes on screen graphic banner, in chat message with your link and your information in our description (on platforms where availble). Every Hour on the hour your link and message will be pushed in our chat on: Twitch, Mixer, and Youtube. Your Graphic overlay will be broadcast to all our platforms. We have them. 24/7 in the world's leading interactive Kitten Live Stream. Mulitcasting our live stream to 10+ platforms which include; Twitch, Mixer, Youtube, Facebook, Goodgame.ru, Periscope and several others we average 50+ Concurrent viewers during peak hours! Our growth in gaming communities has be a Pawsitive, wonderful surprise and we've created a loyal community of Crazy Cat Lovers aka the Kitten Krew! Whether it's an graphic overlay or product placement, we'll get your brand in front of our cat lovers! Our viewers will often leave our live stream open as a window to kittens all day while at work, or hang out while relaxing for their evening, for hours! We'll work with you to created a Purrfect experience with our viewers! It's gonna be Clawsome! 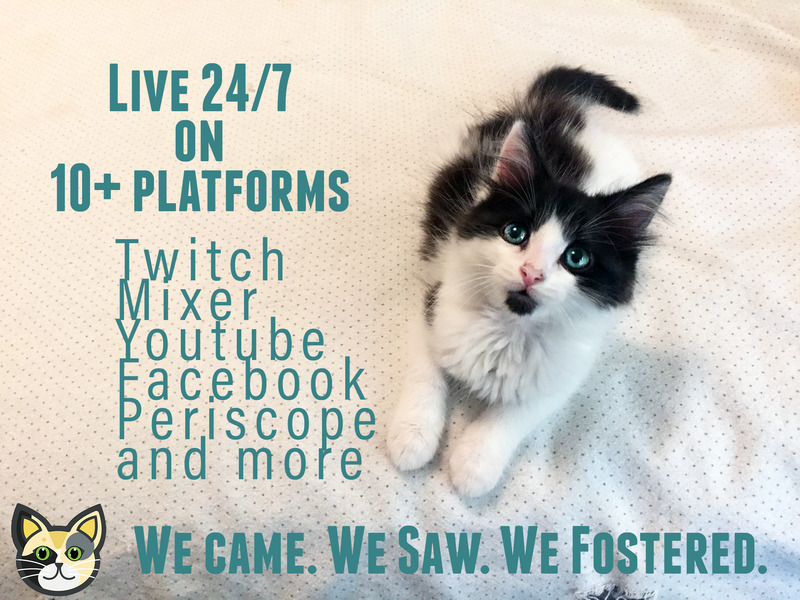 Foster Kittens since 2017, 24/7 Kitten Cam which multistreams to Mixer, Mobcrush, Twitch, Facebook & Youtube.